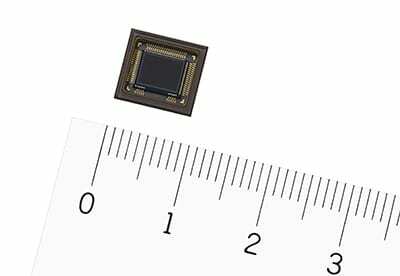 Tokyo, Japan—Sony Corporation today announced the release of the new IMX382 high-speed vision sensor, which enables detection and tracking of objects at 1,000 frames per second. Sony will begin shipping samples in October 2017. This vision sensor features a stacked configuration with a back-illuminated pixel array and signal processing circuit layer. The circuit layer is equipped with image processing circuits and a programmable column-parallel processor, delivering high-speed target detection and tracking. This configuration enables high-sensitivity imaging thanks to the back-illuminated pixel array, with target detection and tracking at 1,000 frames per second. The new sensor uses information such as color and brightness obtained from pixels to detect objects, then extracts the object's centroid, moment and motion vector, and finally outputs the information from the vision sensor in each frame. This vision sensor has achieved imaging, target detection and tracking at 1,000 fps on a single chip. This not only expands the scope of application, but delivers new value that was difficult to obtain with conventional systems. On past systems equipped with a 30 fps processing image sensor, it was not always possible to capture fast-moving objects and/or phenomena. At 1,000 fps, approximately 33 times faster in imaging speed than conventional chips, the new product can capture fast-moving objects and detect objects from image information, while using high-speed processing to extract information such as centroid, moment, and motion vector. Because the processing results can be output from the sensor in each frame, feedback to the system is faster than conventional methods. Delays in detecting anomalies or malfunctions in production lines at factories and other places can produce fatal results. However, this vision sensor makes it possible to instantly capture such events, so that orders can be issued quickly to stop the system. Conventional industrial robots are normally operated by specifying motion coordinates using a program. Utilizing the high-speed tracking functionality of this vision sensor, however, enables real-time feedback to robots, enabling autonomous robot operation that is responsive to the movement and status of objects. This helps make robot teaching more efficient, contributing to improved productivity. On conventional systems, the image processing required for detecting and tracking of objects has to be carried out at a later stage (on a computer, or other computing device). This vision sensor changes all that by delivering imaging, target detection and tracking image processing on a single chip. Not only does this make the later stage devices more compact and help to save overall system power; it also expands the new system development potential by eliminating certain physical limitations. Timed with the sample shipping, Sony will also be providing evaluation kits. The evaluation kit consists of the camera and control software, making it easy to evaluate the sensor in diverse customer environments. Sony is focusing intently on the sensing field and seeking to leverage its potential in the image sensor market. By integrating the imaging technology that it has developed over the years with sensing technologies that enable information acquisition and utilization, Sony strives to pioneer new applications and new markets for image sensors. The signal processing circuit layer on the bottom of the stacked configuration is equipped with image processing circuits and a programmable column-parallel processor, delivering high-speed target detection and tracking. This construction enables high-sensitivity imaging with back-illuminated pixel array and achieves target detection and tracking at 1,000 frames per second. The new sensor uses information such as color and brightness obtained from pixels to detect objects, then extracts the object's centroid, moment and motion vector, and finally outputs the information from the vision sensor as a signal in each frame. The product achieves imaging and image processing on a single chip. Not only does this make for a more compact overall system and power savings; it also expands the new system development potential by eliminating certain physical limitations. For system output, in addition to the image data output pathway the chip is also equipped with an output pathway solely for sensing information, so users can select between them for their particular application. The evaluation kit consists of a camera and software and is designed makes it easy to evaluate the sensor in a variety of customer usage environments.